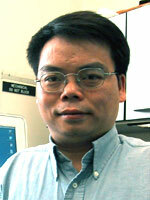 Dr. Luo graduated in Molecular Genetics in 1993 from the University of Illinois at Urbana-Champaign. He became a postdoctoral fellow at University of Texas MD Anderson Cancer Center in 1993, and then a Research Associate in Dr. Allan Bradley at the Howard Hughes Medical Institute at Baylor College of Medicine in 1996. He is the recipients of the Howard Temin Award from the National Cancer Institute in 2000, the Basil O'Connor Starter Scholar Award from the March of Dimes Foundation in 2001, and the Searle Scholar Award in 2001. He has served as an Associate Editor for the journal of Current Genomics since 1999. Dr. Luo joined the Department of Genetics and the Ireland Cancer Center at CWRU and University Hospitals of Cleveland in May, 2000. My laboratory use mouse to model human diseases and to conduct other aspect of genetic studies, including gene identification. We are currently using knockout mouse models to study a unique class of human syndromes that are caused by mutations in RecQ DNA helicase homologues. Defects in RecQ DNA helicase homologues in these human syndromes have led to genomic instability and cancer predisposition and a great variety of other abnormalities. We are particularly interested in studying how defects in individual RecQ helicase can lead to specific disease phenotypes in these distinct yet similar syndromes. A mouse model for both Bloom and Rothmund-Thomson syndromes are now being studied in the laboratory. We are also continuing to further develop the Sleeping Beauty (SB) transposon as an insertional mutagen for mouse genetic study. The SB transposon is the only known active DNA transposon in mice. We are currently using this transposon system to set up transposon-tagged mutagenesis strategies for phenotype-driven genetic screens in mice to identify novel candidates genes for cancer as well as other human diseases. Recql5 Plays an Important Role in DNA Replication and Cell Survival Following Camptothecin Treatment. RECQL5/Recql5 helicase regulates homologous recombination and suppresses tumor formation via disruption of Rad51 presynaptic filaments. Deletion of murine kininogen gene 1 (mKng1) causes loss of plasma kininogen and delays thrombosis. A nuclear function of Hu proteins as neuron-specific alternative RNA processing regulators. 15-Hydroxyprostaglandin dehydrogenase is an in vivo suppressor of colon tumorigenesis. Inhibition of multiple gene expression and virus replication of HBV by stable RNA interference in 2.2.15 cells. Recql5 and Blm RecQ DNA helicases have nonredundant roles in suppressing crossovers. Defective sister-chromatid cohesion, aneuploidy and cancer predisposition in a mouse model of type II Rothmund-Thomson syndrome. 15-Hydroxyprostaglandin dehydrogenase, a COX-2 oncogene antagonist, is a TGF-beta-induced suppressor of human gastrointestinal cancers. Telomere shortening exposes functions for the mouse Werner and Bloom syndrome genes. Cancer predisposition caused by elevated mitotic recombination in Bloom mice. Luo G, Santoro IM, McDaniel LD, Nishijima I, Mills M, Youssoufian H, Vogel H, Schultz RA, Bradley A.
Chk1 is an essential kinase that is regulated by Atr and required for the G(2)/M DNA damage checkpoint. Disruption of mRad50 causes embryonic stem cell lethality, abnormal embryonic development, and sensitivity to ionizing radiation. Luo G, Yao MS, Bender CF, Mills M, Bladl AR, Bradley A, Petrini JH. Proc Natl Acad Sci U S A. (1999);96(13):7376-81. Luo G, Ivics Z, Izsvak Z, Bradley A.
Proc Natl Acad Sci U S A. (1998);95(18):10769-73. Spontaneous calcification of arteries and cartilage in mice lacking matrix GLA protein. BMP-7 is an inducer of nephrogenesis, and is also required for eye development and skeletal patterning.